Impose fees, charges or other conditions for use of the Membership Service (with reasonable notice). If any of the terms contained in the TOU become unacceptable to you in the future, you may cancel your membership by notifying our Customer Membership Service Department by email at artcollinstrading -at- gmail.com. Please allow at least five business days for such cancellation to become effective. Art Collins Trading is a publisher. You understand that the no content published as part of the Membership Service constitutes a recommendation that any particular security, portfolio of securities, transaction or investment strategy is suitable for any specific person. You further understand that none of the information providers or their affiliates will advise you personally concerning the nature, potential, value or suitability of any particular security, portfolio of securities, transaction, investment strategy or other matter. To the extent any of the content published as part of the Membership Service may be deemed to be investment advice, such information is impersonal and not tailored to the investment needs of any specific person. You understand that the Membership Service may contain opinions from time to time with regard to securities mentioned in other Art Collins Trading products, and that those opinions may be different from those obtained by using another Art Collins Trading product. You understand and agree that, although we do not permit our editorial staff to hold positions in individual stocks, outside contributing columnists or their affiliates may write about securities in which they or their firms have a position, and that they may trade for their own account. In addition, outside contributing columnists may be subject to certain restrictions on trading for their own account. However, you understand and agree that at the time of any transaction that you make, one or more contributing columnists or their affiliates may have a position in the securities written about. The Membership Service and the content available through the Membership Service are the property of Art Collins Trading and its licensors. You may access and use the content, and download and/or print out one copy of any content from the Membership Service, solely for your personal, noncommercial use. You acknowledge that you do not acquire any ownership rights by using the Membership Service. If you are interested in reprinting, republishing or distributing content from Art Collins Trading, please contact Customer Service at artcollinstrading -at- gmail.com. 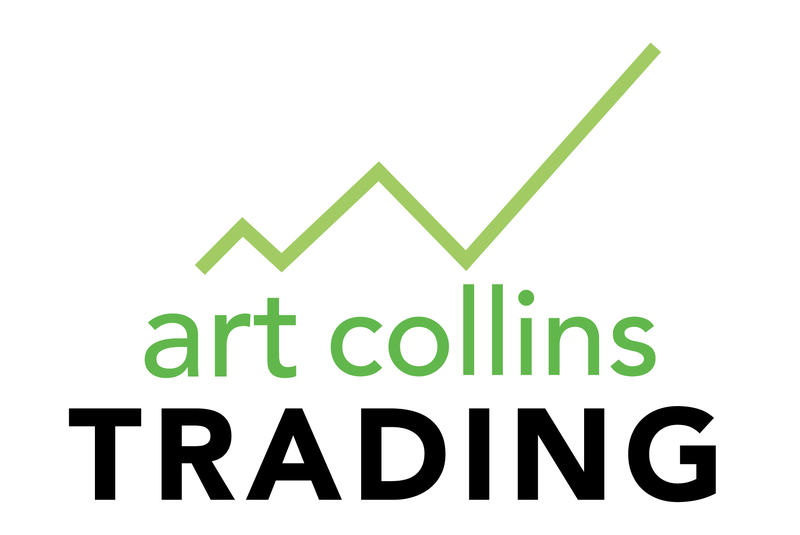 “Artcollinstrading.com,” “Art Collins Trading,” the Art Colins Trading Logo, and other marks are trademarks and/or service marks of Art Collins Trading. All other trademarks, service marks, and logos used on our web sites are the trademarks, service marks, or logos of their respective owners. You may not republish, upload, post, transmit or distribute content available through the Membership Service to online bulletin boards, message boards, newsgroups, chat rooms, or in other any manner, without our prior written permission. Modification of the content or use of the content for any purpose other than your own personal, noncommercial use is a violation of our copyright and other proprietary rights, and can subject you to legal liability. Harvest or collect information about users of the Membership Service without their express consent. You also agree to comply with all applicable laws, rules and regulations in connection with your use of the Membership Service and the content made available therein. Your use of certain services made available to you by Art Collins Publishing may be governed by additional rules, which are available on our web sites or by hyperlink from other sites, in connection with the service. By using any service you are acknowledging that you have reviewed all corresponding rules and agree to be bound by them. Some of the services may have been provided by third parties for your use. In the event that any service or tool is provided by a third party, such service or tool may become unavailable in the event that the agreement between us and the third party is terminated. You expressly acknowledge and agree that your use of all services and tools is solely at your risk. Content available through the Membership Service may contain links to other Internet web sites or resources. We neither control nor endorse such other web sites, nor have we reviewed or approved any content that appears on such other web sites. You acknowledge and agree that we shall not be held responsible for the legality, accuracy, or inappropriate nature of any content, advertising, products, services, or information located on or through any other websites, nor for any loss or damages caused or alleged to have been caused by the use of or reliance on any such content. THE MEMBERSHIP SERVICE, AND ANY CONTENT, PRODUCT OR SERVICE OBTAINED OR ACCESSED THROUGH THE MEMBERSHIP SERVICE, IS PROVIDED “AS IS” AND WITHOUT REPRESENTATIONS OR WARRANTIES OF ANY KIND, EITHER EXPRESS OR IMPLIED. TO THE FULLEST EXTENT PERMISSIBLE PURSUANT TO APPLICABLE LAW, Art Collins Trading, ITS OFFICERS, DIRECTORS, EMPLOYEES, AFFILIATES, SUPPLIERS, ADVERTISERS, AND AGENTS DISCLAIM ALL WARRANTIES, EXPRESS, IMPLIED OR STATUTORY, INCLUDING, BUT NOT LIMITED TO, IMPLIED WARRANTIES OF TITLE, NON-INFRINGEMENT, MERCHANTABILITY, AND FITNESS FOR A PARTICULAR PURPOSE, AND ALL WARRANTIES RELATING TO THE ADEQUACY, ACCURACY OR COMPLETENESS OF ANY INFORMATION AVAILABLE THROUGH THE MEMBERSHIP SERVICE. ART COLLINS TRADING AND ITS AFFILIATES, SUPPLIERS, AGENTS AND SPONSORS DO NOT WARRANT THAT YOUR USE OF THE MEMBERSHIP SERVICE WILL BE UNINTERRUPTED, ERROR-FREE, OR SECURE, THAT DEFECTS WILL BE CORRECTED, OR THAT THE MEMBERSHIP SERVICE OR THE SERVER(S) ON WHICH THE MEMBERSHIP SERVICE IS HOSTED ARE FREE OF VIRUSES OR OTHER HARMFUL COMPONENTS. YOU ACKNOWLEDGE THAT YOU ARE RESPONSIBLE FOR OBTAINING AND MAINTAINING ALL TELEPHONE, COMPUTER HARDWARE AND OTHER EQUIPMENT NEEDED TO ACCESS AND USE MEMBERSHIP SERVICE, AND ALL CHARGES RELATED THERETO. YOU ASSUME TOTAL RESPONSIBILITY AND RISK FOR YOUR USE OF THE MEMBERSHIP SERVICE AND YOUR RELIANCE THEREON. NO OPINION, ADVICE, OR STATEMENT OF ART COLLINS TRADING OR ITS AFFILIATES, SUPPLIERS, AGENTS, MEMBERS, OR VISITORS, WHETHER MADE ON THE SITE OR OTHERWISE, SHALL CREATE ANY WARRANTY. YOUR USE OF THE SITE, THE CONTENT CONTATINED THEREIN, AND ANY MATERIALS PROVIDED THROUGH THE SITE, ARE ENTIRELY AT YOUR OWN RISK. A possibility exists that content available through the Membership Service could include inaccuracies or errors, or materials that violate the TOU. Additionally, a possibility exists that unauthorized alterations could be made to the content available through the Membership Service by third parties. Although we attempt to ensure the integrity of our web sites and other products and services, we make no guarantees as to the completeness or correctness of any content available through the Membership Service. In the event that such a situation arises, please contact us at artcollinstrading -at- gmail.com with, if possible, a description of the material to be checked and the location (URL) where such material can be found on our web sites, if applicable, as well as information sufficient to enable us to contact you. We will try to address your concerns as soon as reasonably practicable. For copyright infringement claims, see the section on “Copyright Infringement” below. NEITHER ART COLLINS TRADING NOR ITS AFFILIATES, SUPPLIERS, ADVERTISERS, AFFILIATES, OR AGENTS OR SPONSORS ARE RESPONSIBLE OR LIABLE FOR ANY INDIRECT, INCIDENTAL, CONSEQUENTIAL, SPECIAL, EXEMPLARY, PUNITIVE OR OTHER DAMAGES UNDER ANY CONTRACT, NEGLIGENCE, STRICT LIABILITY OR OTHER THEORY ARISING OUT OF OR RELATING IN ANY WAY TO THE MEMBERSHIP SERVICE AND/OR ANY CONTENT CONTAINED THEREIN, OR ANY PRODUCT OR SERVICE USED OR PURCHASED THROUGH ART COLLINS TRADING . YOUR SOLE REMEDY FOR DISSATISFACTION WITH THE MEMBERSHIP SERVICE IS TO STOP USING IT. THE SOLE AND EXCLUSIVE MAXIMUM LIABILITY TO COMPANY FOR ALL DAMAGES, LOSSES, AND CAUSES OF ACTION (WHETHER IN CONTRACT, TORT (INCLUDING, WITHOUT LIMITATION, NEGLIGENCE), OR OTHERWISE) SHALL BE THE TOTAL AMOUNT PAID TO US BY YOU, IF ANY, FOR ACCESS TO THE MEMBERSHIP SERVICE. You agree to indemnify, defend and hold us, our officers, directors, employees, agents and representatives harmless from and against any and all claims, damages, losses, costs (including reasonable attorneys’ fees), or other expenses that arise directly or indirectly out of or from (a) your violation of the TOU; (b) your use of the Membership Service; or (c) your violation of the rights of any third party. You understand and agree that Art Collins Trading may, under certain circumstances and without prior notice to you, terminate your access to and use of the Membership Service. Cause for such termination shall include, but not be limited to, (i) breaches or violations of the TOU or other agreements or guidelines, (ii) requests by law enforcement or other government or regulatory authorities, or (iii) technical difficulties. The Digital Millennium Copyright Act of 1998 (the “DMCA”) provides recourse for copyright owners who believe that material appearing on the Internet infringes their rights under U.S. copyright law. If you believe in good faith that materials hosted by Art Collins Trading or one of its subsidiaries infringe your copyright, you (or your agent) may send us a notice requesting that the material be removed, or access to it blocked. If you believe in good faith that a notice of copyright infringement has been wrongly filed against you, the DMCA permits you to send us a counter-notice. Notices and counter-notices must meet the then-current statutory requirements imposed by the DMCA; see http://www.loc.gov/copyright/ for details. Notices and counter-notices with respect to our web sites should be sent to artcollinstrading -at- gmail.com. The TOU, together with all Art Collins Trading policies referred to herein, constitutes the entire agreement between you and Art Collins Trading relating to your use of the Membership Service and supersedes and any all prior or contemporaneous written or oral agreements on that subject between us. The TOU and the relationship between you and Art Collins Trading are governed by and construed in accordance with the laws of the State of Illinois without regard to its principles of conflict of laws. You and Art Collins Trading agree to submit to the personal and exclusive jurisdiction of the federal and state courts located within Cook County, Illinois, and waive any jurisdictional, venue, or inconvenient forum objections to such courts. If any provision of the TOU is found to be unlawful, void, or for any reason unenforceable, then that provision shall be deemed severable from the TOU and shall not affect the validity and enforceability of any remaining provisions. No waiver by either party of any breach or default hereunder shall be deemed to be a waiver of any preceding or subsequent breach or default. Any heading, caption or section title contained in the TOU is inserted only as a matter of convenience and in no way defines or explains any section or provision hereof. We reserve the right to require you to sign a non-electronic version of the TOU.